For one, they have an air-conditioned dining area. (SPOT.ph) “Almost everything we used here is recycled,” Jamo Baron, co-owner of Grub Hub, proudly shares as he talks about how he and his sister Mika Baron Ong, together with his brother-in-law Ron Ong, built Grub Hub, the newest food park along Visayas Avenue. What used to be a branch of Fiesta Island Seafood Hub (or F.I.S.H.) was transformed by the siblings into a sprawling food destination, repurposing the materials from the closed restaurant to build their park. With the massive space suddenly available to the Grub Hub team, there was a lot of room for creativity. Mika was in charge of designing the place while Ron helped in construction. 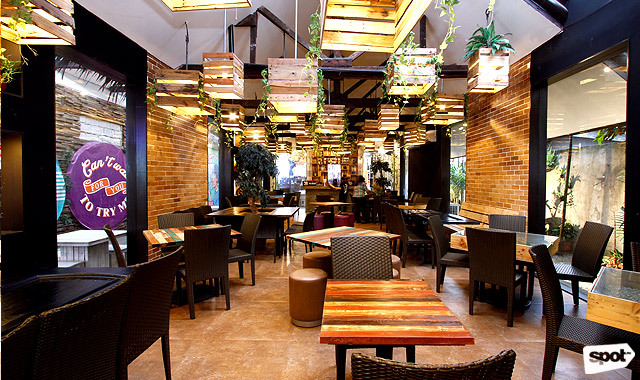 Their combined efforts resulted in an artsy park divided into three dining areas, each with their own themes. The Junkyard, called such because most of the materials from the old F.I.S.H. 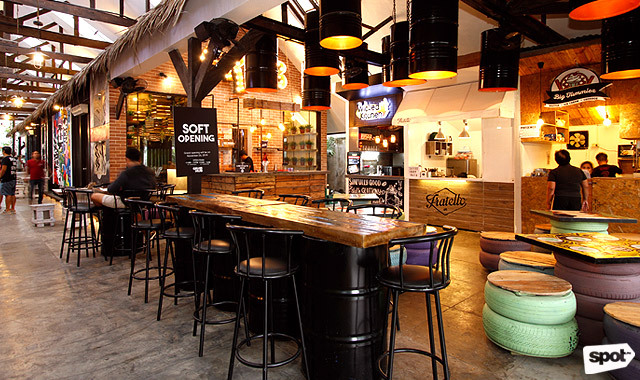 were recycled for the furnishings of this area, has old tires turned into comfy seats and wood tables decorated with art by Jamo and Mika’s artist friends. Those who’d love to get in the food park craze but aren’t a fan of al-fresco dining will be glad to find out that Grub Hub has an air-conditioned dining space. The Greenhouse, which is also where the bar is located, features terrarium tables and hanging plants for an indoor garden vibe. 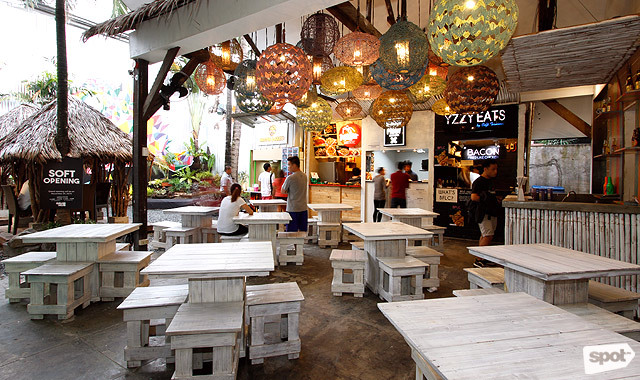 At the back area is the Hippieyard, which Jamo describes as having a “trippy hippy feel.” The space, with nipa hut dining spots and huge colorful lanterns, also features a stage where budding artists and musicians invited by Grub Hub can perform for the crowd. In the middle of the food park runs The Hobbit Hall, where food stalls are housed in hobbit holes inspired by Lord of The Rings. Currently, there are 15 stalls to choose from, with two more opening soon. Read on as we round up our favorites. Don’t expect the usual Japanese fare at Aji Sushi. 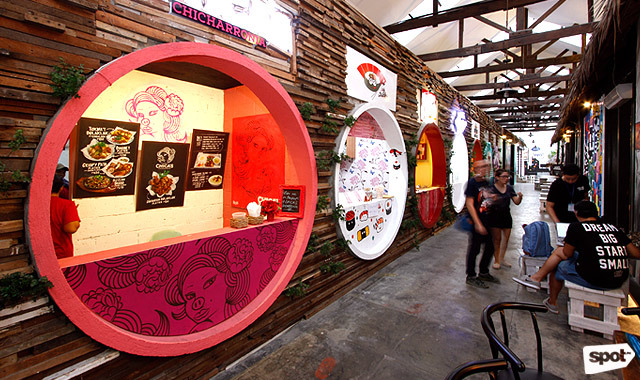 Run by Charles Chua and his partner Angelica Bonifacio, this stall offers unique takes on Japanese favorites like sushi, maki, and tonkatsu. 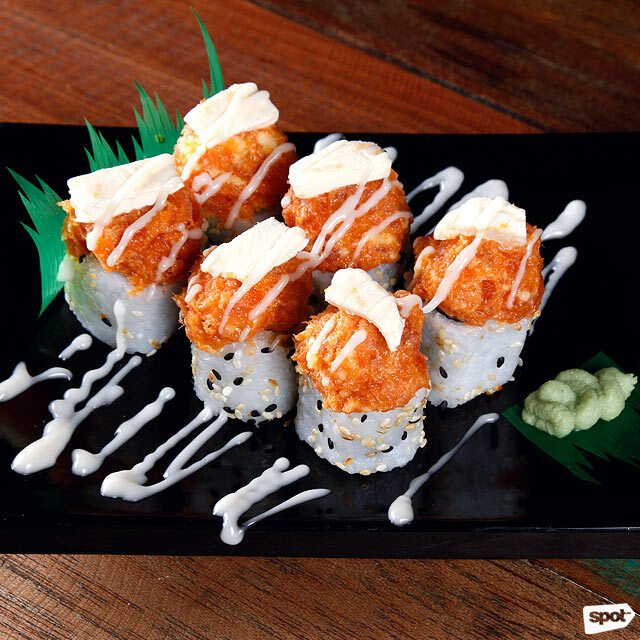 The Cheetos Roll (P139) is a spicy tuna roll with cream cheese, bacon, and crushed Cheetos, topped with the cheese curl for a crunch that doesn’t overpower the rest of the already tasty roll. The Alaska Roll (P149), with tuna, cream cheese, and ebiko, is a cheesy bite that is understandably a crowd favorite. The Tonkatsu (P199) is also done a little differently here. A recipe of Charles’s mother, the pork is covered in a breading that is lighter and also sweeter than usual for a meal that doesn’t overwhelm the palate. As their name implies, Papa Beer serves grub that pairs well with ice-cold beer. All their fried fare remain crispy even after hours in the open air, but we guarantee that at the speed you’ll be munching on them, that won’t be a problem. 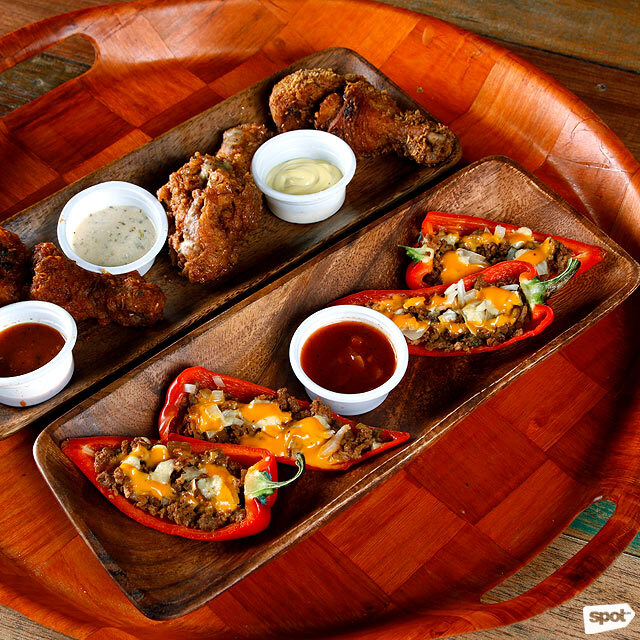 There’s pulutan for every kind of beer drinker, and even for those who just want finger food to go with conversations. 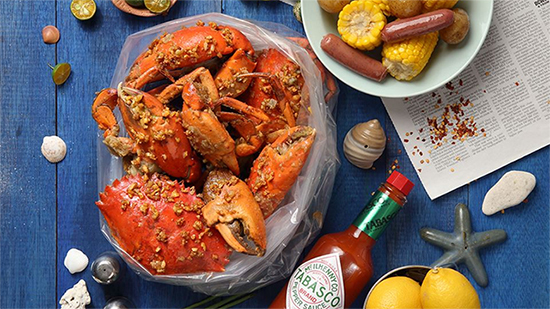 For seafood lovers, there’s the Grablets Crablets (P160) and the Pare Calamare (P160), both beer-battered and fried until golden, both chewy but not difficult to eat. 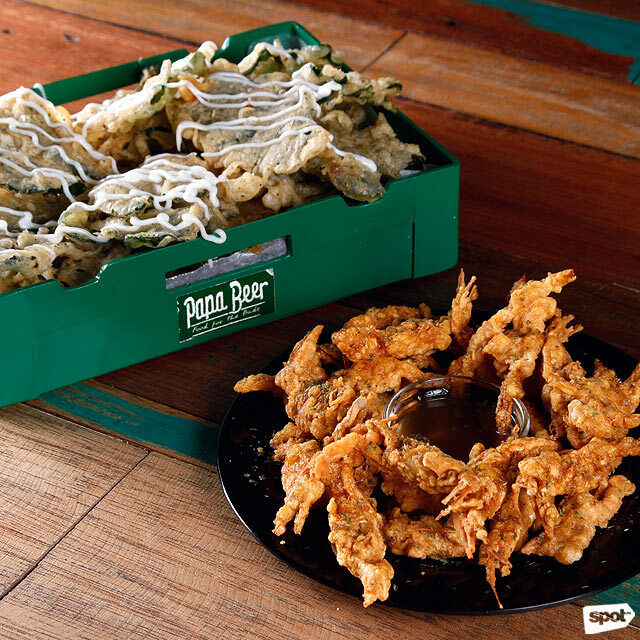 Veggie lovers, or anyone who wants to pretend they’re having something healthy can opt for the Crispy Greens (P65/single, P125/bucket), which are crunchy, beer-battered kangkong leaves. 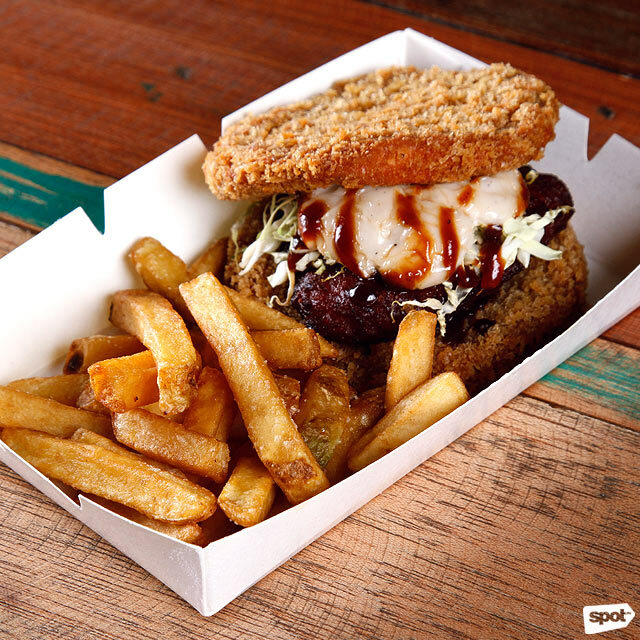 Prepare to get your hands dirty at Miggy Piggy, with their menu of “sloppy-fied” comfort food. You can’t go wrong with the Sloppyfied Chicken Fingers (P180), with fried chicken fillets lying on top of a bed of fries that’s been smothered in meat sauce and a beer and cheese sauce. No threat of a heart attack could stop us from devouring the Chori Friedwich (P160), or a perfectly sweet-salty chorizo patty with a tangy barbeque sauce and a cool Greek salad sandwiched between two slices of deep fried bread. 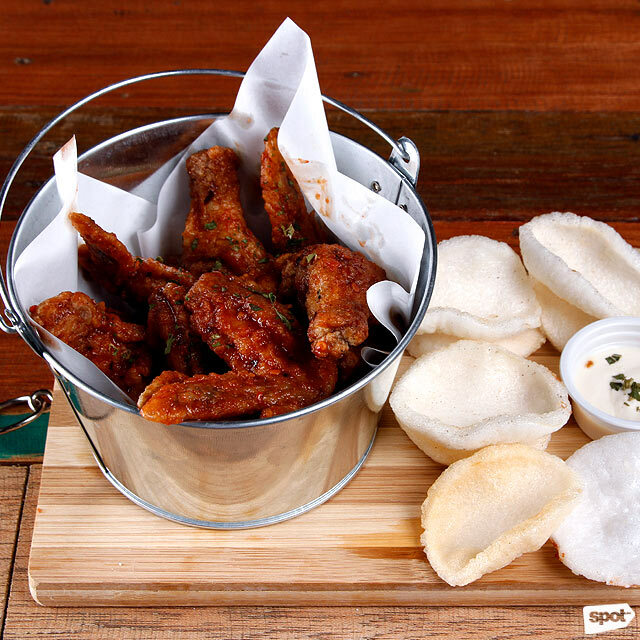 Wings is the perfect food park meal, especially when they come in servings large enough for sharing. For only P180, you can get eight pieces of perfectly fried, crisp and juicy wings at St. Mick’s. They come in four interesting flavors, but we personally can’t get enough of the Sriracha Honey, sweet with just the right amount of heat from the Sriracha—even the those who like their wings mild will enjoy this. The Garlic Parmesan is also a must-try, with a cheesy coating we can’t resist licking off our fingers. While the norm has become putting twists on classic fare, sometimes it’s also good to just focus on old-school favorites and do them excellently. This is true for Chicas, who concentrate on providing food park goers Filipino pulutan fare that is no-frills. 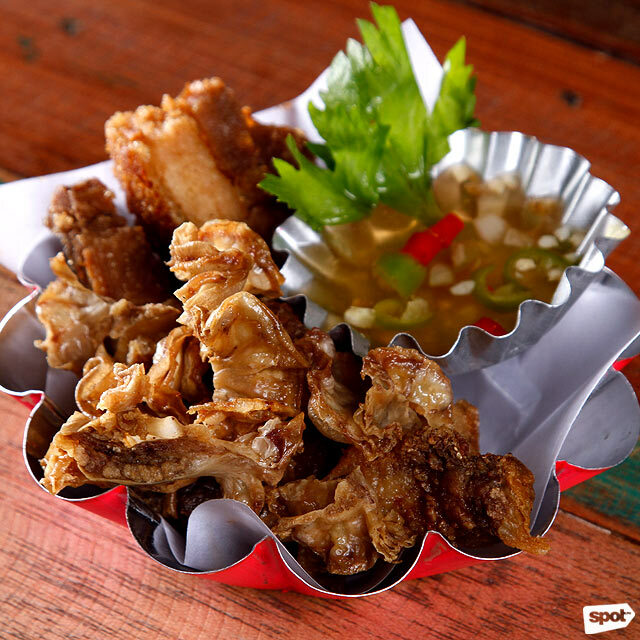 Their Bagnet Platter (P290) is crispy with just the right thickness of fat. Their Sizzling Sisig (P275) is made crunchier with chicharon flakes—meaty, flavorful, and goes well with ice cold beer. Surprisingly, Mrs. Lumpia goes beyond lumpia and offers almost anything and everything. Of course lumpia is on the menu, with variations like the Tinapang Lumpia with Garlic Rice (P129) or the Taco Lumpia (P80). 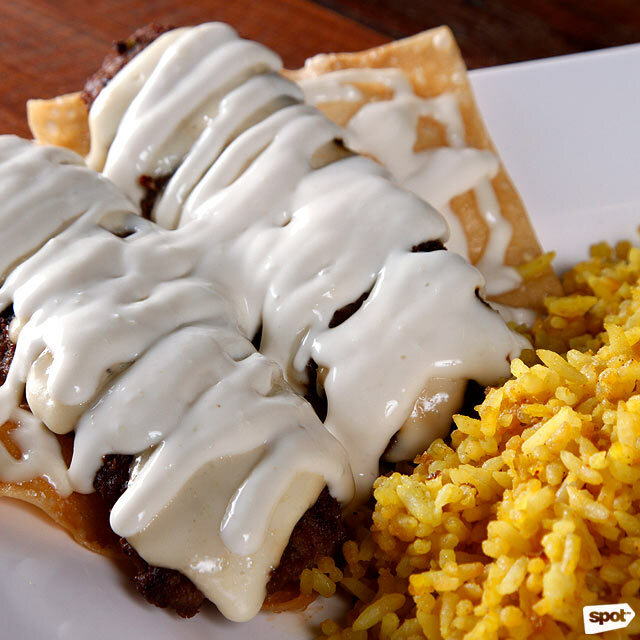 But you’ll also find surprising menu items like the sweet and cheesy Lasagna Roll (P80) or the filling Beef Shawarma with Shawarma Rice (P129), which is like a deconstructed version of the Mediterranean dish. Here at Brook’s, American comfort food is the focus, hence the name Brook’s—short for Brooklyn. If we want true comfort, two things we turn to are a cheeseburger and a grilled cheese sandwich, and Brook’s fuses the two together in the Grilled Cheese Sandwich Burger (P200). 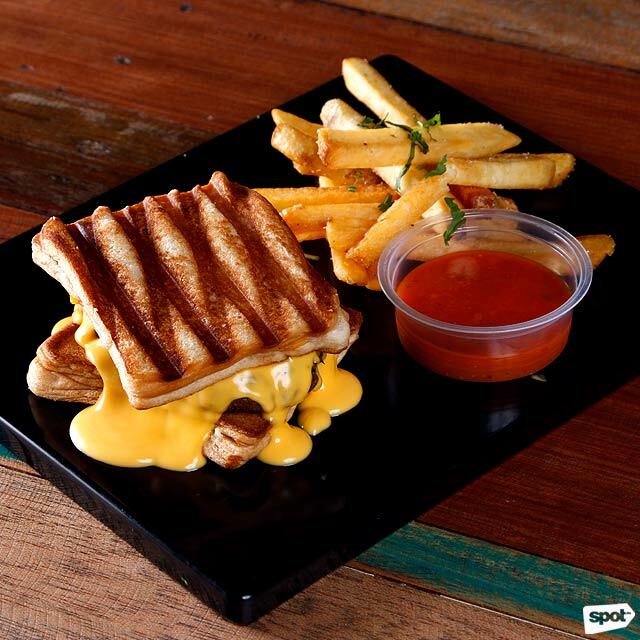 A thick and juicy beef patty is topped with a rich cheese sauce and packed between two hefty grilled cheese sandwiches with gooey cheese oozing out with every bite. Another indulgent meal is the Truffled Cream Sauce Carbonara (P240), with the truffle adding richness to the creamy sauce that’s generously poured over pasta. Like a true Mexican food place, Noble packs all their offerings with loads of intense flavor. All the recipes at Noble are by the family, and all sauces like the salsa and queso sauce are made in-house. Classic Mexican fare like the Quesadilla, which come in Beef (P150) and Cheese (P115), as well as the overloaded and generously-sized Nachos (P175/regular, P220/large), are all superb, but don’t miss out on other items like their flavorful Pollo de Noble (P195/four pieces, P375/eight pieces), which comes in three variations: Pollo Flameado which is the spicy variant, El Coco Pollo with coconut breading, and Lima Pollo, zesty with a hint of lime and cilantro. 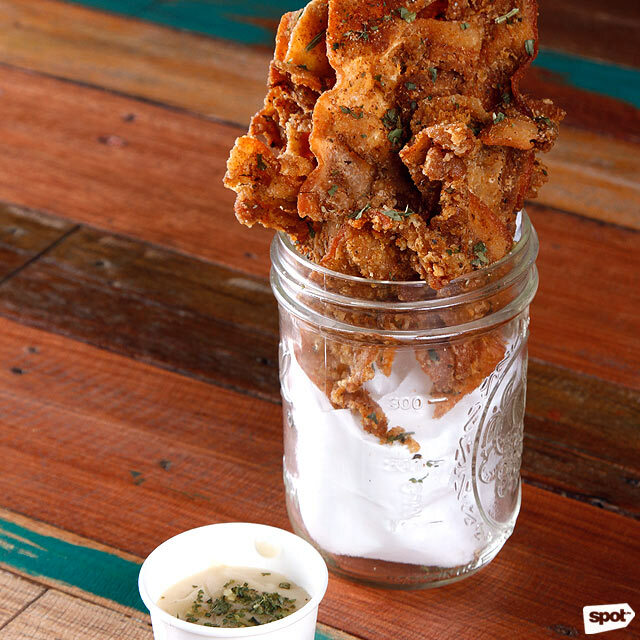 Yzzy Eats is actually an off-shoot of Café Terminal, a quaint nook along Congressional Avenue famous for their Bacon Fried Like Chicken (P85/solo, P165/regular), which looks just like fried chicken skin. Owner Yzzy Montealegre decided to bring the fried goodness to Grub Hub after several requests from regulars for beer to go with the bacon. We’re glad she did, because these deliciously crunchy, perfectly salty bacon-like-chicken are the perfect pulutan. 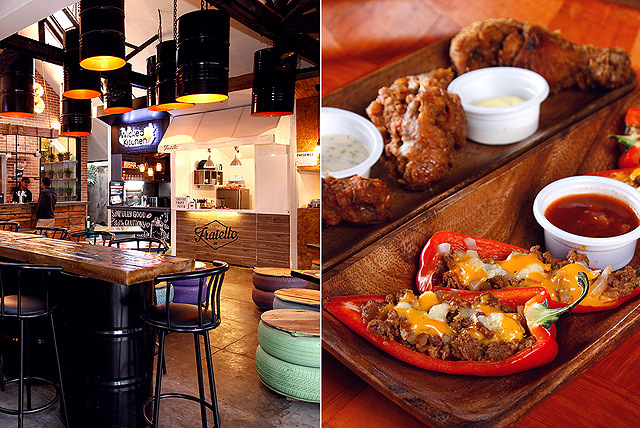 The famous food stall from UP gets a second home here at Grub Hub. 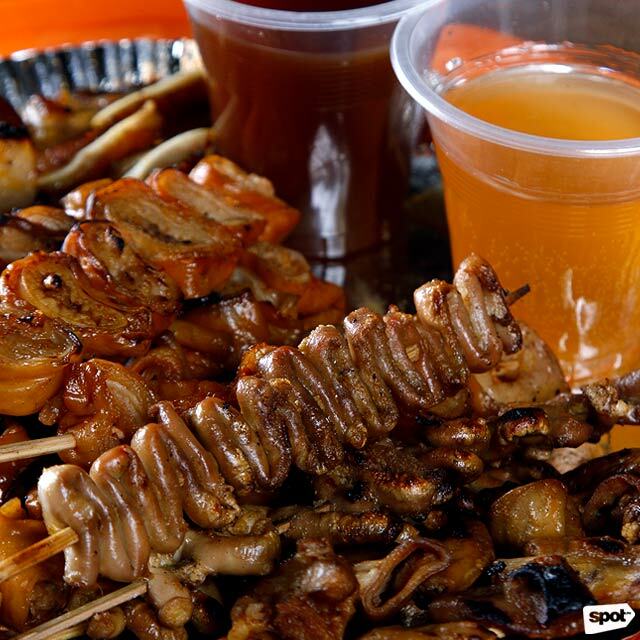 They’ve also gotten a makeover, with a modern art rendition of the famous Mang Larry—but their signature Isaw Baboy (P10), Isaw Manok (P10), and other grilled skewers continue to be the same slightly chewy, perfectly charred bites we love. The Maginhawa restaurant known for serving delectable pastas and other comfort food brings their sinfully good desserts to Grub Hub. Each dessert is named after one of the Seven Deadly Sins, and with sweets this good, you’ll just have to forgive us if we indulge. Greed (P188) is a skillet of smores—dig in the melted chocolate and marshmallows with a graham cracker and while it’s good for sharing, you’d be tempted not to. 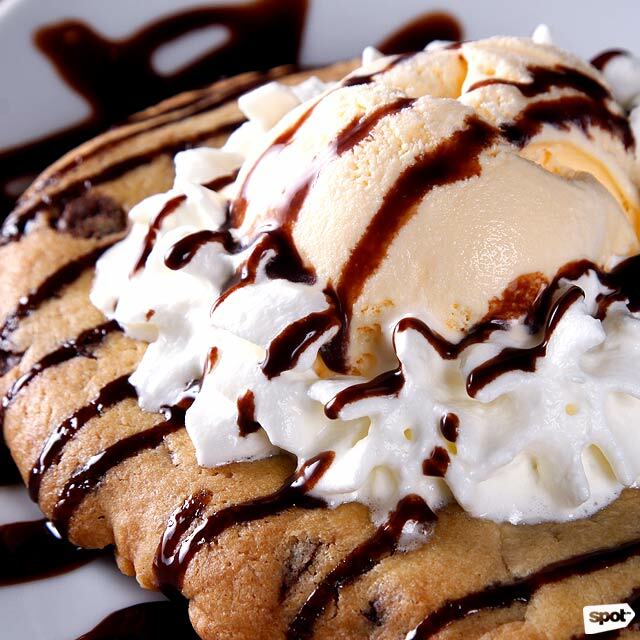 Gluttony (P185/single, P325/to share) is also good for more than one person, with a plate-sized warm and soft chocolate chip cookie served with a scoop of vanilla ice cream and a drizzle of chocolate syrup—but if you feel like keeping this sweet treat all to yourself, honestly we can’t blame you. There’s no time for diets here at Big Tummiez, with their line of churros and waffle-based desserts. 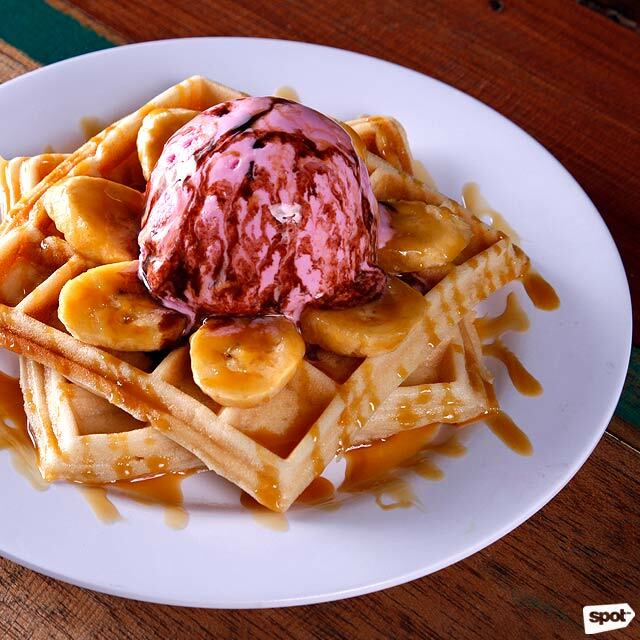 Their Banana Caramel Waffle (P120) is the perfect treat—a scoop of strawberry ice cream on top of a fluffy vanilla waffle with generous servings of sliced bananas and a drizzle of caramel syrup. Try to get everything in one spoonful—the effect is similar to a banana split. 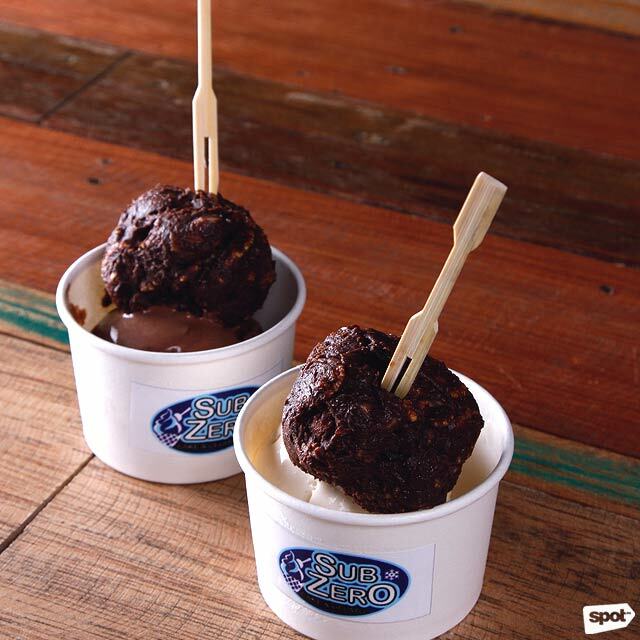 The passion for ice cream is evident when one talks to Sub Zero’s owner Marc Suanson. Marc is confident that he can create any flavor and invites customers to give him suggestions, but for now his line already features superbly made flavors. 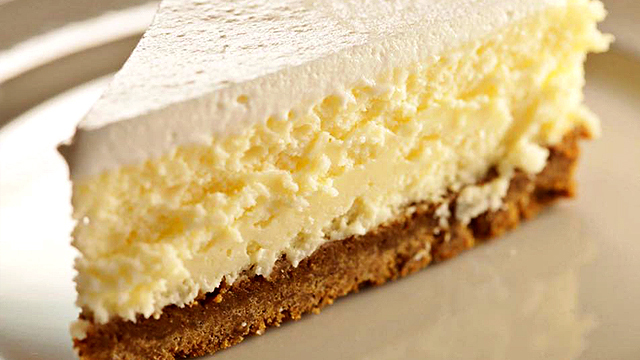 The New York Cheesecake has the tartness and mild sweetness of the cheesecake in a thick gelato. His ice cream is topped with a cake pop that varies every week or so. On the day we came, we were handed a gelato topped with a chocolate truffle cake pop, that resembled a Ferrero Rocher both in looks and flavor perfectly. 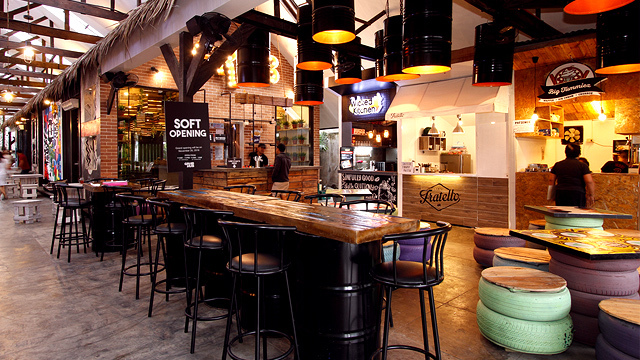 Frequent food park visitors have most probably seen Café Fratello and their new renditions of ice cold frappes and other beverages. While they are more known for their coffee blends, their other ice cold drinks are also must-tries. 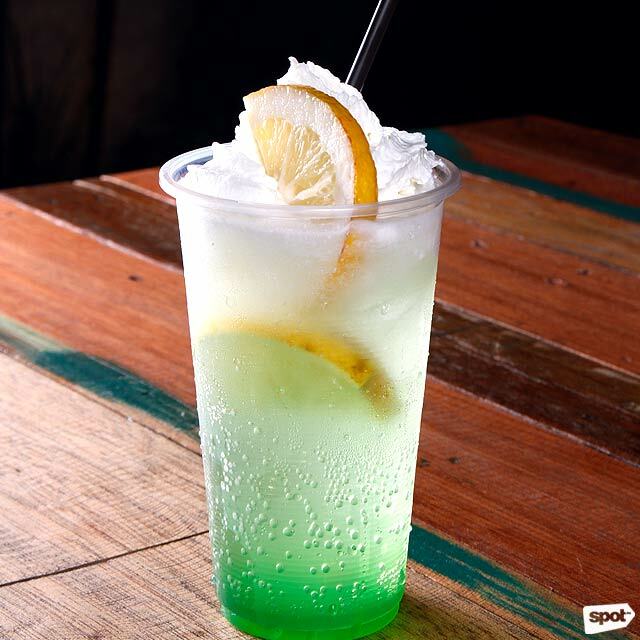 Their Italian Cremosa (P95), made with sparkling soda, fruit syrup and whipped cream, is zesty and refreshing. The bestselling Oreo Pretzel Cream (P150) isn’t just snapshot-worthy; it’s like a cookies and cream ice cream blended into a deliciously sweet drink.